At transportation terminals, automation is boosting productivity and creating safer work environments. In the medical device industry, it’s advancing product development and letting employees learn new technologies. And in aerospace, it’s leading to new manufacturing processes and a future age of autonomous aircraft. At Thursday’s Fall Engineering Distinguished Lecture, representatives from all three industries shared how automation is changing the world—and the workforce. Did you know that if the top 500 U.S.-based manufacturing companies were counted as an independent nation, their total revenue would rank them as the third largest economy in the world! Yet, the US manufacturing sector has experienced substantial job losses at an alarming rate over the past two decades. Since the historical peak in the late 1970s, fewer and fewer jobs have been created in the manufacturing sector. In fact employment in manufacturing is now at its lowest since 1950. Human biologists, computer scientists and engineers are teaming to advance neuroscience toward achieving yet another one of NAE’s Grand Challenges, namely, understanding the complex network we call brain. Modern noninvasive methods can simultaneously measure the activity of many brain cells. Comprehension of how the brain works will enable engineers to simulate its activities, leading to deeper insights about how and why the brain works and fails. Over the past century, engineering has made numerous fundamental contribution to the field of medicine. From the most prosaic forms of engineering like sewer and water sanitation, to chemical engineering processes to produce drugs like penicillin in economical form, and now with medical applications of robotics, engineering has been crucial is increasing human life expectancy. 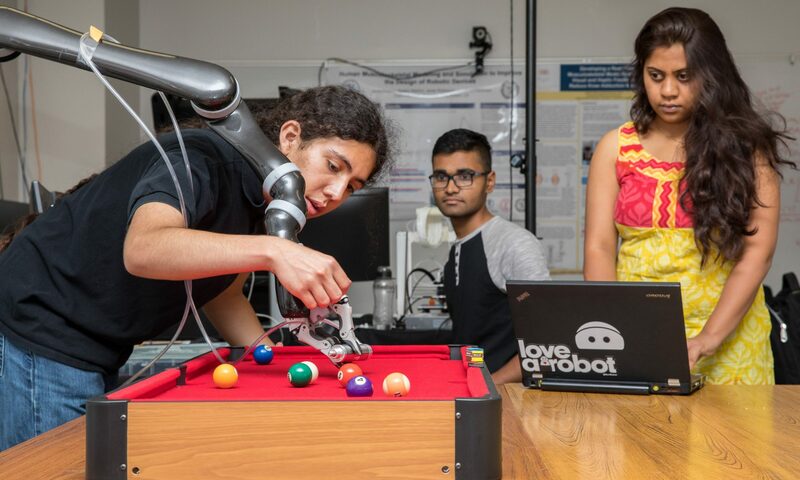 Nowadays robots and automated devices are applied in many diverse forms such as replacing a missing limb, performing a very delicate surgery, delivering rehabilitation therapy like neurorehabilitation for stroke patients, and assisting with learning disabilities. Modern applications of robotics in medicine are more diverse than ever before. Beside surgery and rehabilitation therapy, these devices are used for medical training, prosthetics, and assisting the aging population and persons with disabilities. Future likely applications of medical robots will be to perform tasks that are otherwise impossible, such as enabling new microsurgery procedures by providing high-dexterity access to small anatomical structures, and integrating high precision imaging into the OR.